Number8 has won the Buma Music meets Tech Award, which includes a cash prize of €5,000.-. 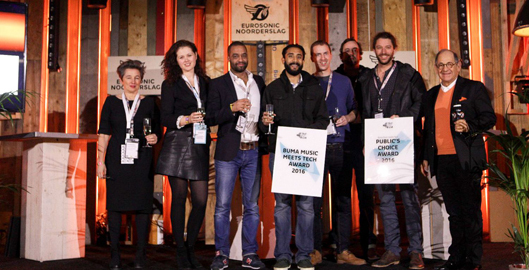 Gigstarter won the Buma Music meets Tech Public’s Choice Award. They received the awards from jury chairman Ralph Simon during Eurosonic Noorderslag in Groningen, which was co-organised by Buma. The jury was looking for the concept that goes outside the box looking at the current music industry standards, and judged the entries on innovation and added value. Jury chairman Ralph Simon (Mobilium, GB) and jury members Jeroen van Erp (Fabrique), Todd Hansen (SXSW), Monique van Dusseldorp (TedEx), Chris Carey (Media Insight Consulting) and Kirsten van Houten (Buma/Stemra) decided that the entry from Number8 best fulfilled these requirements. Jury: “The 2016 Buma Music meets Tech Awards reflected a high standard of originality, very modern, commercial thinking and creative ways of expanding the wider music- and live industries. The public could vote for their favourite start-up using the #BMMT16 app. The start-up that had received the highest rating, Gigstarter, won the Buma Music meets Tech Public’s Choice Award. Buma Music meets Tech is the innovative programme initiated by Buma/Stemra which supports and motivates start-ups and accelerates growth. Buma Music meets Tech offers them a platform to promote themselves to, for example, professionals and the public. A network of companies, entrepreneurs, collective management organisations and investors will provide start-ups with the opportunity to evolve into a service with an effective business model. By offering exposure, networking, sharing of know-how and experience with professionals, validation by collective management organisations and a network, Buma Stemra meets Tech acts as kick-start for innovative music-related start-ups. Buma Music meets Tech organizes a pitch programme for start-ups and a conference programme about innovation during Eurosonic Noorderslag 2016.